This isn't important to most people, but to us who have skydived its enormous. A pilot and nine skydivers were feared dead today after a plane crashed in the US's Washington Cascades. Yeah, that's really me. Always the dark glasses. I have a better pic showing my free fall, but its poster size and I can't scan it. They all died. 9 of them were under 30. But it wasn't skydiving related, it was plane related, so it shouldn't dissuade other skydivers. True. Sky diving isn't to blame. What I find disturbing is the crash itself. I've flown with various sky dive pilots and they all seemed to be particularly able. That is, if something extraordinary happened They reacted competently and calmly. Why one would crash in the Cascades is curious to say the least. The Cascades, as well as any mountainous regions are tricky and dangerous, but the pilot should have been familiar with the area. For perspective, I sky dived out of Snohomish airport many times and going over the Cascades was not unusual nor anything any of us feared. Footnote: One weekend I decided to forgo a few jumps at Snohomish. 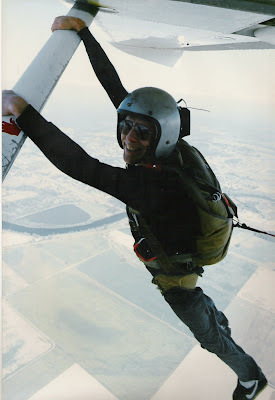 Had I not, I could have sky dived with Patrick Swayze. Just name dropping here.